Grab Shot 98 - "Headless Rhea"
"I took this whilst out at the Zoo with my little boy having a fun day out -- as well as looking for shots for this month's photo assignment," said Karl Gartland. "Originally, I was going to submit it for the Texture assignment, but finally decided it worked better as a grab shot. 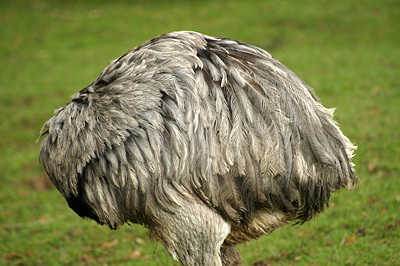 It's a photo of a Rhea who was busy grooming him/her self and not in the bit interested in the crowds of people walking by." Karl used a Canon EOS 400D (XTi) in Aperture Priority mode (5.6) at 160th of a second with the ISO set to 100. The focal length was 190mm.